In 2016, Colwood Council eliminated annual business license renewal fees as one step toward encouraging business retention, expansion and new business development. Business owners now pay a one-time fee when they first apply for a business license, then complete a quick and easy, free online renewal each year to keep their license in good standing. Feedback from business owners about the change has been positive, and the City was awarded the “Order of the Bear” by the Canadian Federation of Independent Businesses in recognition of the change. The new renewal process provides an annual touchpoint for the City to check in with business owners. It also makes it easier for members of the public to find a Colwood business on the online business directory. Perhaps most importantly, it provides meaningful data about the makeup of Colwood’s business environment. 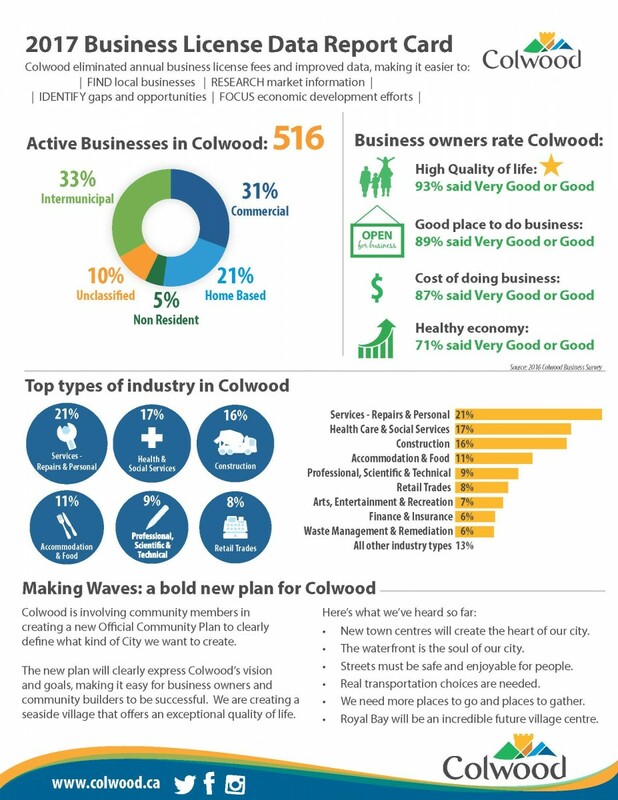 The City can now more easily report on the number of businesses in Colwood for any specific time period, breaking it down by type of business (e.g. home based, commercial, intermunicipal) or by sector (e.g. retail, health, manufacturing). Combined with qualitative data from business surveys, this foundational data can be tracked over time to measure success and target economic development efforts. The followin 2017 Business License Data Report Card offers a preliminary look at recent data for discussion.